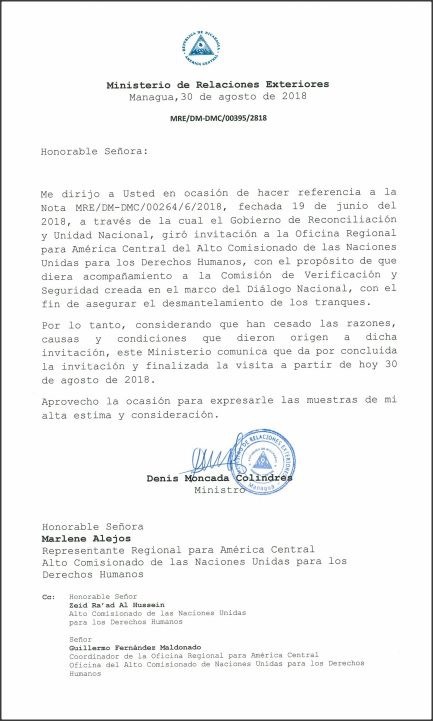 The Government of Daniel Ortega orders the departure of the representation of the Office of the United Nations High Commissioner for Human Rights (OACNUDH) for having “ceased the reasons, causes and conditions that originated the invitation.” OACNUDH confirms that it received the communication from the Government, terminating its visit. The European Union suspends the cooperation program with the National Police of Nicaragua, of which 3.5 million Euros where yet to be executed. Judge imposes a sentence of 23 and 12 years in prison on teenagers Brandon Lovo and Glen Slate, sentenced for the death of journalist Ángel Gahona. 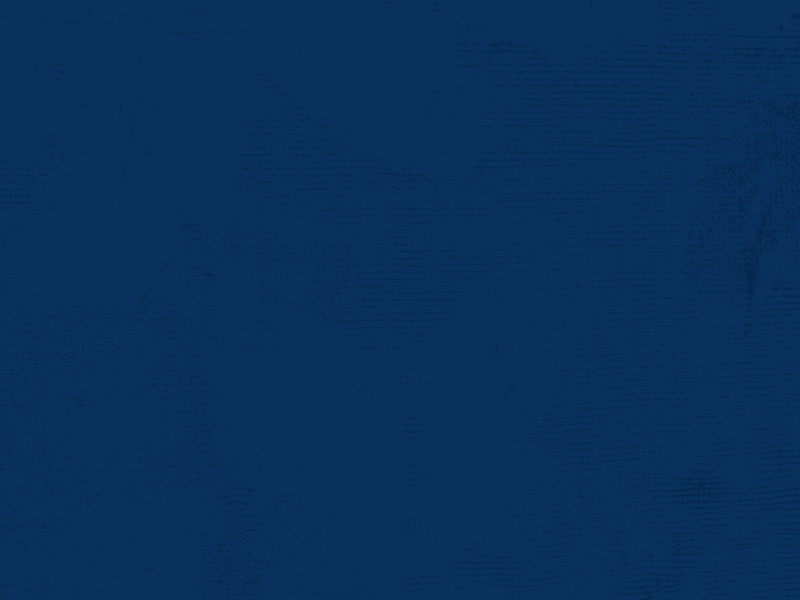 The Inter-American Press Association (SIP) is alarmed by the siege and aggression of Daniel Ortega’s government against the independent press in Nicaragua. Journalist Jon Lee Anderson, in an article in the New Yorker, opines that President Ortega “tried to regain control, adopted a strategy employed by autocrats in Turkey, Egypt, Venezuela and elsewhere: condemn their political opponents as traitors, incite the masses to violence and then deny responsibility. Carlos Trujillo, Permanent Representative of the United States to the OAS, indicates that the Government of Nicaragua continues to isolate from the international community and that they are watching the hearings of the UN and the OAS. At least $41 million run away from the banks after the announcement of the Central Bank of Nicaragua to make adjustments within the exchange regime. Coffee growers claim from the Government of Nicaragua the 19 million dollars from the funds that they put into the National Commission for the Transformation of Coffee (Conatradec). Deployment of supporters of the government party and anti-riot in Managua after the government order to expel a UN mission. Relatives of former retired military officers Carlos Brenes and Tomás Maldonado accused of terrorism, request the Nicaraguan Army to intercede for them since both are founders of the military institution. Representatives of the private industry indicate that the reports of the UN and the IACHR will have a strong impact on financing and external investment. President Daniel Ortega creates the order Commander of the revolution Tomás Borge Martínez to recognize the work of the 22 policemen killed in the protests. Authorities of the UNAN-Managua place outside the university a collage with photographs of alleged damage to the site with the legend: “What if it was your home?” A message that experts say contradicts the speech of “normality” that the orteguista regime proclaims. Public Ministry accuses the soprano Olesia Auxiliadora Muñoz Pavón of destroying the streets of the municipality of Niquinohomo in Masaya. Guillermo Jacoby, president of the Association of Producers and Exporters of Nicaragua (APEN) indicates that Nicaragua lost 15 markets and exports will not recover. 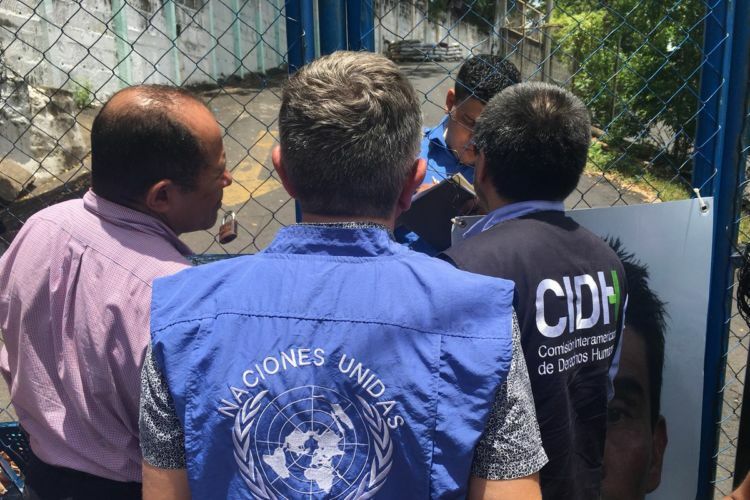 The Permanent Commission of Human Rights (CPDH) denounces that citizen Harry Holman Zelaya, detained last August 19th in Nindirí, has been illegally held for 12 days in the cells of El Chipote. Priest Luis Alberto Herrera, rector of the Cathedral of Managua on the occasion of the 25th anniversary of the construction of that temple, affirms: “We never imagined the attack of the Police in the cathedral”. The UN points out to members of the National Police responsible for the massacre in the Carlos Marx neighborhood where a family was incinerated, including two minors. “Those cells are like hell,” says Corby Dave Hodgson, who was detained for ten days in the cells of El Chipote for participating in the protests against the regime. Parents denounce that teachers of the public schools in Madriz, Nueva Segovia, try to convince the students that the demonstrators are coup leaders and terrorists. Authorities of the UNAN-Managua expel 82 students for participating in the protests against the regime while calling on students to resume classes of the first semester of 2018. Carlos Alvarado, president of Costa Rica, affirms that his government is not willing to hand over to Nicaraguan authority’s information about Nicaraguans who have requested refuge in their country. Authorities of the National Technological Institute (Inatec) dismiss Rebecca Montenegro from Trinidad, mother of Elsa Valle, one of the university students arrested for participating in the protests. A group of 50 non-governmental organizations ask that the crisis in Nicaragua be addressed by the UN Security Council, since the most essential democratic values have been broken in the country. Epsy Campbell, First Vice President and Foreign Minister of the Republic of Costa Rica, reports that her Government condemns the force out of the United Nations High Commissioner for Human Rights. The reinvention of reality, Camilo Egaña of CNN highlights that the Government of Nicaragua is doing everything possible to show that everything is clear and calm in the country. The Civic Alliance for Justice and Democracy repudiates the forced departure of the UN mission and assures that with these actions the Government shows its lack of will to seek a peaceful solution to the crisis. Paramilitary groups and police prevent the march of self-convoked citizens in Estelí. Monsignor Rolando Álvarez expresses that Nicaragua “must build a culture of human rights” and respect the sacred and inviolable right to life.